shelly's summary: Peace, Love, and Polish... a pink & orange birthday party!!! Peace, Love, and Polish... a pink & orange birthday party!!! when i saw this lemon loves lime dress i fell in love with it and i knew it would be her birthday dress and i would do her whole party in those colors to match her dress! and that is just what she had and she loved it! 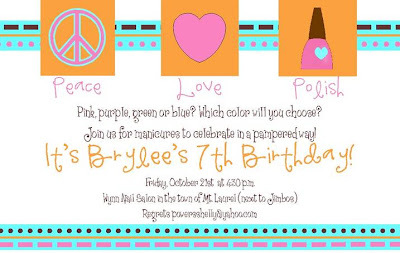 I used Inviting You Designs for brylee's invitations... i have used them for tons of things in the past especially when my kids were little... i got thank you cards, calling cards, bottle and sippy cup stickers, and of course other birthday invites too. Heather and Amy never disappoint and you can't bet the price. When I sent Heather an email... i sent her a picture of brylee's dress to show her our birthday colors and told her we wanted peace signs.... and after a few more emails... this was our final product... brylee was so excited when they came in and so was I... they were just what we wanted! and of course a cupcake! cupcakes with toppers also made by Inviting You... candle and cake time for the birthday girl.... make a wish... As always I had so much fun collecting and making all the items for the birthday party and I know the birthday girl and all her friends had a great time too! What a FUN party. And cute pictures of her too. You sure know how to make a great party. I might need to hire you! This is precious! I love, love, love it!! Love, love, love this! Will you plan Bentleys party? Lol, so cute and creative!! I love this Shelly!!! Fabulous colors for her party!! oh my shelly.. I LOVE it all... brylee is a lucky little girl!!! I love how the dress was the inspiration.. great pics too!!! hope to see you next week!! !